UPS is testing trucks made of an ultra-light material that makes them more fuel efficient than their sheet-aluminum counterparts. UPS has the unfortunate task of figuring out how to deliver packages without bleeding cash in our resource-constrained world. Last year, UPS announced an ambitious goal: The company planned on increasing its package-delivery fleet fuel efficiency by 20% between a 2000 baseline and 2020. The obvious path to those goals is combination of hybrid electric vehicles and natural gas-powered trucks (both are technologies that the company is exploring). But UPS is also going for a more revolutionary solution: The shipping giant is testing plastic trucks that are supposedly both lighter and more fuel efficient than their sheet-aluminum counterparts. 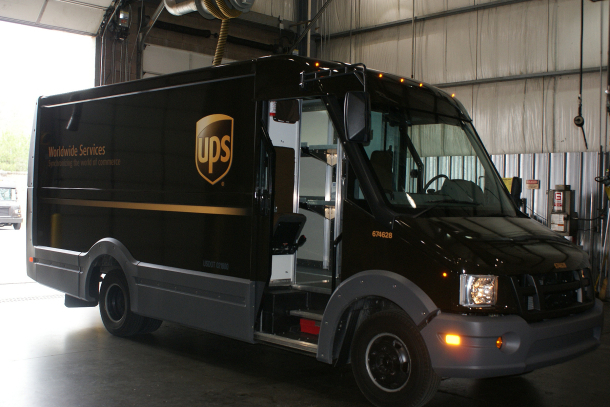 According to UPS, the diesel trucks come with body panels made out of ABS plastic, which makes them 1,000 pounds lighter than standard trucks. This lightness–and the smaller engine it allows–makes the trucks 40% more fuel efficient, a feature that could save the company 84 million gallons of fuel each year if the technology becomes widespread. sabotage in there somewhere… but the underlying message is the same! Translation: We shouldn’t ditch existing technology that can still be improved if the new technology isn’t ready for the big time–especially if the costs for the improved diesel trucks are comparable to the standard trucks. Wondering what to look out for when a plastic UPS truck rolls down your street? Check out the truck below (hint: It looks a lot like a regular UPS truck).